Lost & Co now offers loyalty membership to our regular customers and it’s free to sign up. You will receive a special loyalty card and become part of the lost & Co team. at our Battersea & Putney sites. Why not fill in the form and sign up today. 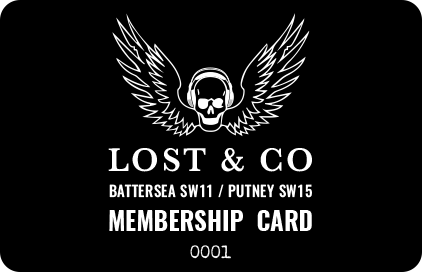 Once the form is completed, you can collect your loyalty card* from either lost & Co in Battersea or Putney. *Please note, the above offers do not run in conjunction with any other special promotions. Over 21’s only.